The Blue Dial - But Which Blue? The problem with blue dials on watches, which remain as popular today as they were five years ago, is what exact color of blue to use? Go too far one way and you've got purple. A bit too far in the other direction and you have powder blue. And a bit off center and you have turquoise, none of which really work on a pilot's watch. 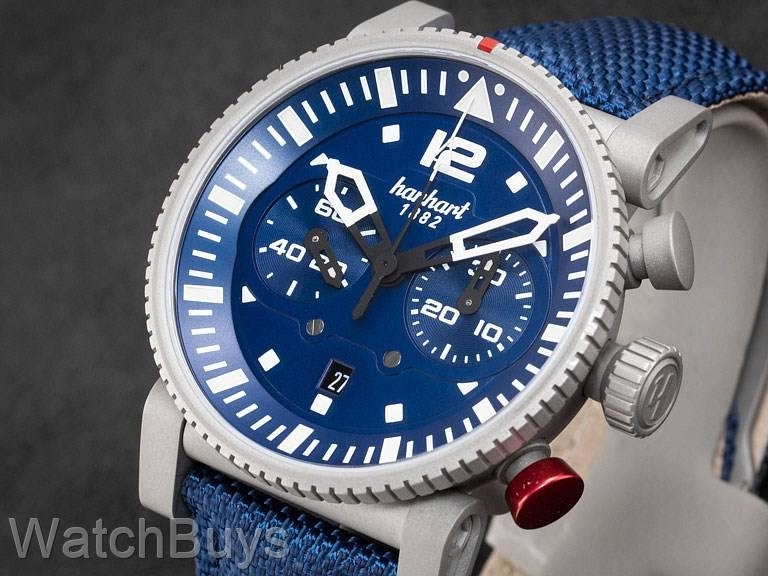 We don't know what tool the watchmakers and designers at Hanhart used, or how they tested their color of blue, but seeing this watch in person convinces us that someone at Hanhart is in fact an expert in the color blue. The dial color is absolutely spot on - it is a dark yet vivid and rich color of blue with a mix of both matte and glossy components that enhance the concave shape of the dial and its outer ring. The overall look is one of extreme legibility with a three dimensional feel, and when matched with the gray bead blasted case the new Hanhart Primus Pilot Blue is a winner. 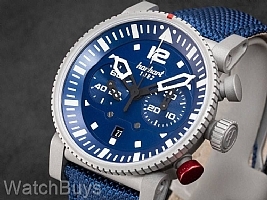 The Hanhart Primus Pilot Blue is a contemporary interpretation of Hanhart's legendary pilot's chronographs, and is ideal for precision timekeeping in the air. Although contemporary in design, this watch remains true to one of the brand's most distinctive features - the red pusher - introduced in 1939 to prevent pilots from unintentionally resetting the chronograph while in operation. The red coating on this pusher has been improved over the years thanks to dental technology so that it remains a permanent part of the watch. To create this chronograph bicompax movement, Hanhart started with a Valjoux 7750 and then designed modifications to achieve the bicompax display. These modifications were carried out under the direction of Manufacture La Joux-Perret, and included adjusting the registers to correctly and proportionally fit the size of the dial (rather than the "pinched look" seen in other chronograph watches of this size). Additional movement modifications were necessary to increase the spacing of the chronograph pushers to a more comfortable position, even while wearing gloves. The result is an incredibly good looking watch that is easy to read, easy to operate and easy to wear. The Hanhart engraved folding clasp is one of the best made that we have seen on any watch brand, and is also bead blasted on a blue fabric strap.